These delicious Wine Blends do not have much if anything in common. They are all reds, they are all wine and they are all blends. For the most part the known varietals are all different as are the winemakers and the countries of origin which include; Argentina, Australia, California and Chile. I originally planned on doing a combined post on all four recent success stories but have since decided to dedicate more time to each. They deserve the attention. The first up is from California. I have to start by saying that this wine is SMOOTH! It goes down way too easily [in a good way of course] with little tannins to speak of. After taking in the aromas for a few minutes the delicateness of this blend truly surprised me. I would say this is the perfect red for those who think red wine cannot be enjoyed in the summer. Even a South Florida summer. When Steve Reeder and Dave Matthews first met, they realized they had a few things in common, like a passion for making wine at least as strong as their passion for drinking it. For The Dreaming Tree wines, they set out to create an approachable Cabernet Sauvignon, Chardonnay, and Red Blend, finding inspiration in the down-to-earth characters and unforgettable flavors that give California’s wine country its rare charm. At The Dreaming Tree, we think the best vintage is pretty much right now and the best pairing is your favorite people. Hey, there’s nothing wrong with collecting wine, but isn’t it more fun to drink instead? In my research I found that their wines are sometimes racked to clarify the wine and to help develop the smooth tannin structure. This would explain my smoothness comments above. After approximately 19 months of aging in oak, the individual varietals [see below] were blended to create The Dreaming Tree Crush Red Wine Blend. This is one wine I would not aerate or decant. It is perfect straight out of the bottle. On the nose I detected a herbaceousness I noted as crushed leaves and also dry tobacco along with cinnamon and a dark fruit forward aroma that was Zinfandel like. On the palate I noted the already referenced smoothness, low tanin level along with; violet, cinnamon, dark fruit and a grassiness I would describe as being close to freshly cut grass. In my opinion and as the Dave Matthews pedigree implies: This Wine ROCKS! Which I decided to Tweet recently. Soon afterwards The Dreaming Tree contacted me to thank me directly and then shared my feelings with all of their followers. It is always good to see an organization so involved with their product line, specially when the product is worth spreading the word about. I also appreciate their way of doing business when it comes to sustainability with the use of; lightweight bottles manufactured with clean-burning natural gas, 100% recycled paper labels, black ink printing—no bleaching, reduced toxins and heavy metals and natural corks from sustainable farms. 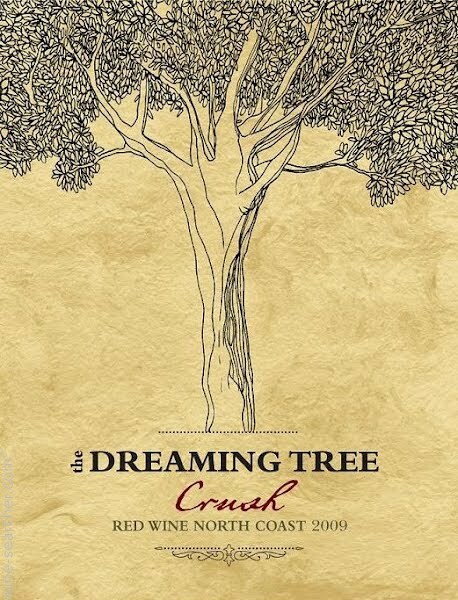 The Dreaming Tree Crush Red Wine Blend truly provided an enjoyable night of wine drinking. So much so that I would easily buy this wine again and recommend it to customers. The price range for this wine is in the $15-$18.00 range but I have seen it being sold for as low as $12.00. If I had a local source pricing this wine that affordably I would be buying it by the case! ¡SALUD! Moderate temperatures throughout the spring and summer made 2009 a very good growing season. The lack of extreme temperatures resulted in higher acidity and aromatic concentration in the white grapes and higher color and tannin development in the reds. Appreciate the informative post, especially the tip about not having to decant their red blend. To decant or not to decant, that is the question… ¡Salud! I’ve seen this … and now will probably purchase! THAT Dave Matthews???? Who knew? YES, very impressive. Received a nice noteagain from The Dreaming Tree thanking me for my review which they shared with all their Twitter followers. Unrelatedly [maybe 🙂 ] Their Cabernet Sauvignon has been selling very nicely this week at our store. Just saw it at $17 in Ohio … but $13 across the river! BTW – Make sure you stop by my celebratory party this weekend, starting Saturday! Friends welcome as well. It always surprises me to see the variations in pricing. Even more interesting is the actual cost of goods sold. I frequently see wines on sale at a price lower than our cost at the store. Most likely a way to get shoppers in the door to buy other things. FYI: Ohio is a price-control state … Kentucky is a free market. I first found the Dreaming Tree wines at Target in Phoenix and now my local grocery store carries them! BTW, I’m a huge Dave Matthews Band fan and we saw them perform at the Hollywood Bowl in September. It was one of the best concerts I’ve ever been to! Gotta love the Hollywood Bowl! Thanks for sharing and visiting my site. Looking forward to checking out yours. Sure hope you get to to try it! Thanks for the visit and comment. You left out one other detail on what Dave and Steve had in common…the money to make the wine. Isn’t that the truth! Thank you. Thanks for checking out my blog. I wonder if I can find this wine in PDX? Sounds delish and I’m always about a good bottle of wine that costs less than $20. Enjoy. Should be available, it seems to have good distribution throughout US. Thanks for visiting and commenting. Hope you get to try it!